Hello, Thank you for coming the little cross-cultural and comprehensive art world which is an interdisciplinary system in my dream and the course of practicing, consists of a Chinese culture and art product series, a dreamed Western ( now mainly American) culture product series and an online flat form. 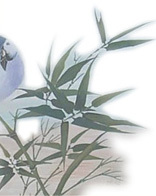 In the current Chinese culture and art product series, it includes two parts: One is a comprehensive art which uses Chinese classical poetry as the joint point to combine traditional Chinese painting, modern Chinese language and I myself created music for creating and adding a new subject in the fields of Chinese as a foreign language, Chinese cultural transmission, and pure art field. The other part is a series of traditional Chinese paintings. In the current Western culture product series, mainly includes a series American culture phenomena which is from a Chinese angle and in a Chinese eyes. In this column below, mainly includes the first part of the Chinese culture art products which I have created with Music, Chinese paintings and articles for the classical Chinese Poetry. I started this creative job since 2005. At the first, I just composed music and article for those most famous ancient Chinese poems and translated the later into English and sang the poem songs in Chinese. Then in 2007, I started to create paintings for the poems, music and articles, and started to sing the poem songs in both Chinese and English. Since 2008, I have been practicing my cross-culture and comprehensive art dreams with art exhibitions, teaching and creating in the USA and almost one year once, twice travels in the US. Since 2010, I have studied Chinese arts in both of China Central Academy of Fine Arts and Chinese National Academy of Arts for 6 years and I will study for another 2 years as a Candidate for Master of Fine Arts until 2019. Below are a part of my comprehensive art studying works and a part of them have collected into two formal publications Poetry, Painting, Music: Comprehensive and Artistic Chinese (Together With Me, Learn Chinese Culture and Language by Enjoying Painting, Music and Poetry) Volume I which was published by Jinan University Press in May, 2013 and Volume II which will be published by the same Publishing House in April or May, 2017. As a dreamer and a practitioner on the little E-bridge Cross-cultural and Comprehensive Art which was created by myself, I am doing very elementary jobs and there are too many things which I need to study and to create. During the process, I do hope to get your good advice, support and help and I do hope you enjoy what I have done.